A Thatcham expert says self-driving cars and greater adoption of automatic safety features won’t kill off the collision repair industry, bodyshop magazine reported Friday. Neale Phillips, strategy and development director for the European equivalent of the IIHS, argued that as some crashes are eliminated by the technology, others which would have been a total loss would be mitigated into something repairable, bodyshop reported. “We think there will be a different type of accident repairer in the future,” he told the International Bodyshop Industry Symposium this month, according to bodyshop. Thatcham also predicted shops might also pick up more electronics business in either scanning, calibrating, or actually working on the expanding slew of sensors and technology in vehicles, bodyshop reported. Reuters reported Wednesday that the National Highway Traffic Safety Administration agreed with Google that a self-driving car design equated the computer with the driver rather than just rejecting the idea outright. “NHTSA will interpret ‘driver’ in the context of Google’s described motor vehicle design as referring to the (self-driving system), and not to any of the vehicle occupants,” NTHSA chief counsel Paul Hemmersbaug told Google in a Feb. 4 letter, according to Reuters’ coverage. But it wouldn’t waive safety requirements like brake pedals for now, Reuters reported. “The next question is whether and how Google could certify that the (self-driving system) meets a standard developed and designed to apply to a vehicle with a human driver,” Hemmersbaug wrote. Everyone’s abuzz over this because so far, a human and steering wheel has been determined to be necessary, according to Reuters. Companies like Google would rather just design the thing without them, the news service reported. 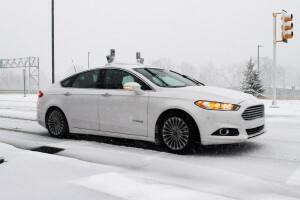 OEMs are still trying to crack the problem of how a self-driving car works in snow, Bloomberg Business reported Tuesday. Issues include how the computer should find lanes; cameras, sensors and lidar made useless or confused by snow and ice; and what to do about the ruts in the snow which become the de facto lanes by traffic consensus.